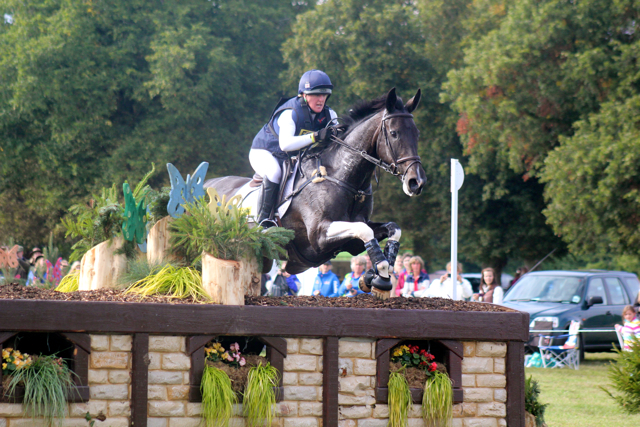 After an annoying abscess kept her London horse, the much-coveted Master Crusoe out of the European Championships a couple of weeks ago, Aoife admitted that should it happen, the win here at Blenheim would be a welcome consolation prize. “It’s a lovely position to be in, she’s a fantastic mare and I love how she’s come on this year and it would be great to finish with that sort of a result but either way, whatever she does tomorrow I’m just delighted with her, she’s only nine and she tried her heart out out there and was just brilliant for me. (Check the leaderboard here). 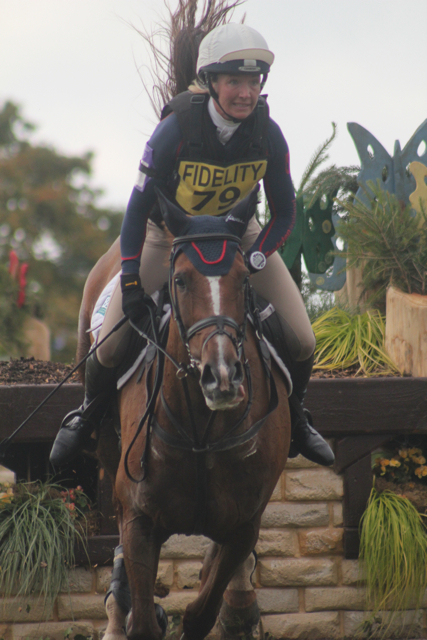 There was only one clear within the time all day and and it moved Gemma Tattersall and Arctic Soul all the way from 22nd after the dressage to fourth place currently. There were 33 clear rounds (roughly a third of the field) , while about 25 combinations were either eliminated or retired. Jean Teulere was clear, and heartbreakingly 1 second faster than Clark Montgomery on Loughan Glen, so although they finish on the same score, Jean takes 2nd place and Clark will lie 3rd going into the show-jumping. Jean Teulere, in his best English (with that French accent!) agreed that he thought the course was tough, and added that although his horse Matelot Du Grand Val went well through all the direct routes he was quite surprised by how steep the drop was after the influential brush corners at 5. The calendar and circumstances meant that Jean was dropping Matelot du Grand Val down a level, nothing to do with the horse; he was thinking about taking him to Burghley but he’d ridden at Haras Du Pins so elected to bring him here instead. Jean hopes that this horse will be a strong contender for the WEG in Normandy next year because he’s four star qualified and has made such huge progress in his dressage. Clark talked about his round afterwards, “I was told to go out there and go quick in the beginning as it was quite hard to make up the time in the end, and so that’s how I approached the ride. It definitely wasn’t the smoothest round I’ve ever had, you definitely had to fight for it all the way round, but the horse has a ton of heart and really tried the whole way. There were several ‘Oh Crap’ moments but he responded when it got a little hairy so that’s all you can ask. 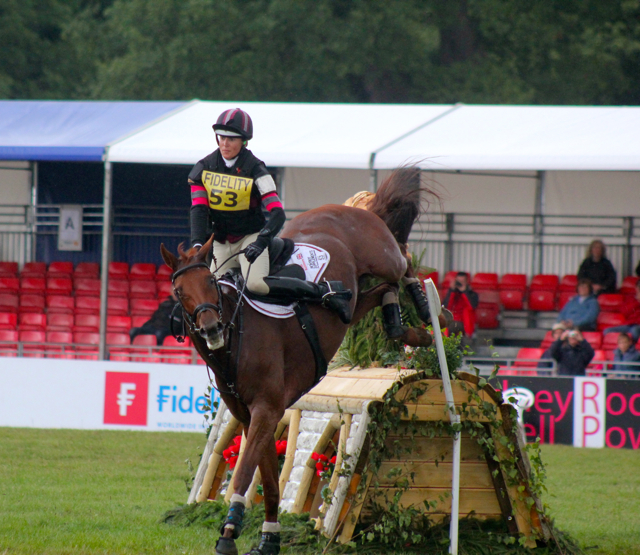 Megan O’Donoghue and Pirate totally rocked it around the course, getting the job done with style. I haven’t managed to catch up with her yet but will be going to find her as soon as I’ve typed this up. Jessie Phoenix also looked wonderful on Pavarotti, and explained to Rupert Bell that her 17 time penalties were just her riding to orders, and that her horse is definitely one to look out for in the future, “This was only his first CCI*** and he’s only done three Advanced leading up to this and I could not have been happier with the maturity he showed out on that course. 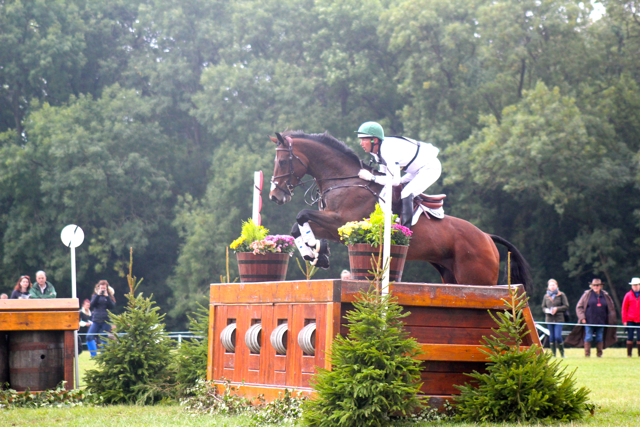 He was super-rideable, he jumped everything so well, he was amazing. This track is riding hard, no-one has made the time (yet! ), there’s been a ton of cross-country faults and Clayton told us just before we left the box to get a clear round over time; it’s the most rideable he’s ever felt cross country, he felt amazing. Dressage leaders Sarah Bullimore and Lily Corinne used up a life at the double of tables at 4, another one in the arena, above, and finally ran out of luck at the Dew Pond, picking up 20 penalties at the skinny brush coming out. 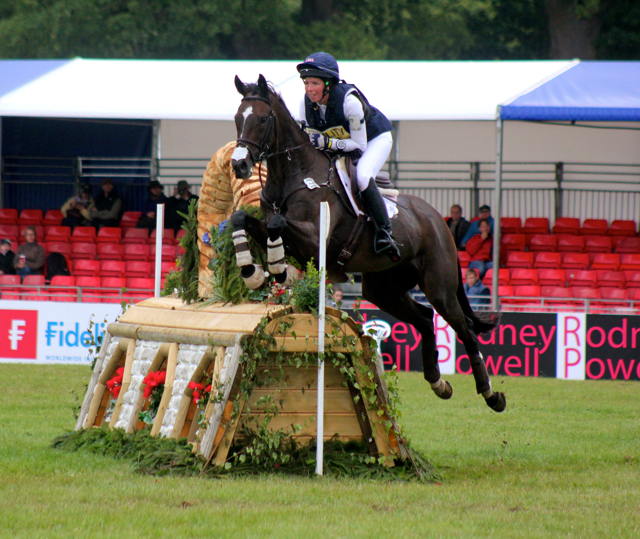 William is currently leading the CIC*** for 8 and 9 year olds with Fernhill Pimms, but his third placed horse in that division Freddie Mac was eliminated after the show-jumping because of some elastic in the straps of his hind boots, which of course in no way gave him any advantage but technically are illegal. Sam Griffiths also fell foul of the same rule, but after he and William had gone, the ground jury started to check boots before rounds, preventing further eliminations. 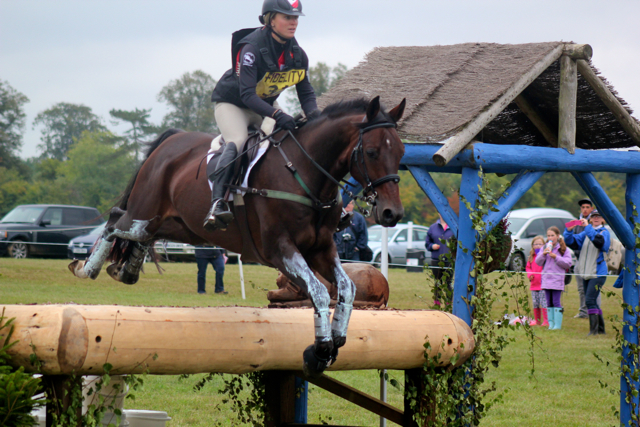 Nicola Wilson and Beltane Queen had a lovely round to finish clear with some time. The Final Horse Inspection is at an ungodly 7:30am Sunday morning, but before I rush off to talk to the US riders for you it’s important to mention how fantastic the organisation has been here at Blenheim these last few days. Not just in the press tent where we’ve been treated like royalty – food, drinks, help with anything we need, fast results, fantastic internet (and thank you for turning a blind eye to Leo!) but also every volunteer has been friendly and helpful, everything has run on time, it’s an absolute pleasure and a privilege to be here reporting for you. 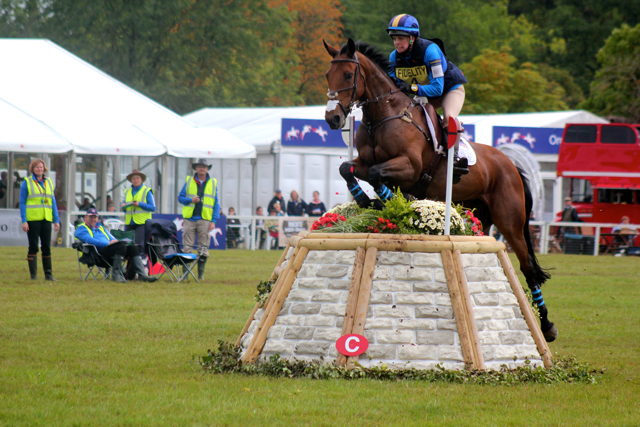 Thank you as always for stopping by Eventing Nation and thank you to the incomparable Fidelity Blenheim International Horse Trials – Go Eventing!